Mapping environmental risk for vector-borne pathogens is a critical tool for disease prevention and control. Our lab has generated the first standardized risk map for Lyme disease based entirely on field-collected data and has modeled the regional dynamics of tick-borne disease spread. 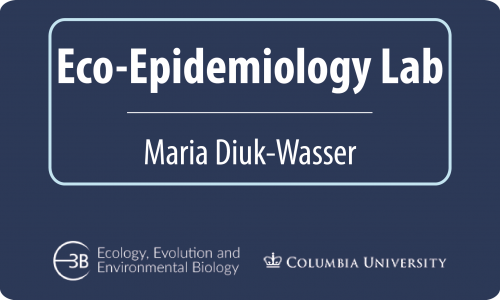 We are currently developing a US-wide model to determine how environmental and socioeconomic drivers influence the speed and direction of spread of different tick-borne pathogens. The model will be informed by: 1) county-level data on the presence of Borrelia spp., Babesia spp., and Anaplasma spp. in ticks and humans; 2) remotely sensed data; and 3) distance of naïve counties from those that are colonized. Results of the statistical analysis will be used to build space-time stochastic models of tick-borne disease invasion. The performance of stochastic models will be validated using 15 years of historical data. The model with the best performance will be used to forecast tick-borne disease invasion for the next decade. The delayed emergence of human babesiosis: a role for pathogen interactions? Human babesiosis is a rapidly emerging tick-borne disease in the United States caused by the protozoan Babesia microti and transmitted by Ixodes scapularis, the Lyme disease vector. Unlike Lyme disease, babesiosis is potentially fatal and poses a threat to blood transfusion recipients. In the Northeast, both Lyme disease and babesiosis were originally restricted to coastal New England. While Lyme disease has expanded dramatically over the past 30 years and now is endemic from Maine to Virginia, babesiosis cases appear to be expanding at a slower rate. This differential spread provides a unique opportunity to examine factors driving pathogen emergence by comparing these species’ natural history and transmission dynamics. Furthermore, because B. microti encounters a large proportion of host populations already infected with B. burgdorferi throughout its geographic expansion, the goal of this study is to investigate how pathogen interactions at the individual, population, and community levels influence B. microti invasion patterns and enzootic prevalence. LAB MEMBERS: Danielle Tufts, Pilar Fernandez, Katharine Walter. Using next generation DNA sequencing, this project characterizes population differentiation and relatedness of blacklegged ticks in the northeastern United States along tick dispersal fronts. By studying population structure and gene flow at a fine spatial scale, we will gain insights into the corridors and landscape barriers that promote/prevent tick dispersal to relate expansion to mammal and bird host movement. The tick population genomics work will inform a spatially explicit host movement model to compare scenarios of tick distribution from small mammal, bird, and deer movement in urban, rural, and natural landscapes.